Cassandra, a mother dwelling in the darkness of an abusive marriage, has no idea that, on an ordinary day, a stranger would save her life. Natalie, a teacher settling for a bland romantic relationship, is flirting with her dream of becoming a writer. These two women have nothing in common but a doctor’s appointment, and, on that day, their fates suddenly shift their courses dramatically. Enter the men, of course, exciting, mysterious and oh so very different from each other: Neil, the gentle musician who won’t talk about himself; Gabriel, the successful Spanish writer, with his seductive accent, fiery temper and a past he’d rather not discuss. And the women, well, they also have their slight stack of undisclosed incidents which should definitely remain that way. But, sadly, that’s not always possible. From the manicured lawns of Westchester’s suburban homes to the wind-swept shores of Long Island, two parallel love stories unwind dramatically, bursting with intriguing characters, naughty little (and not so little) secrets, wicked twists and, mostly, the undeniable bond of friendship. This novel takes place in Westchester and in The Hamptons, on Long Island, New York. The story is written in the first person with two first persons. Religion has a major role in this one also. A single woman, Natalie, is pursued by a nice man who wants to marry her. She has no feelings for the man and considers him a friend. He shows a complete lack of awareness of her feelings. Cassandra, her woman friend by chance (the co-star of this printed movie) is married to a lawyer who is floundering in his life. He blames all his problems on his wife who accepts the blame. Natalie tries to make her see how misguided she is, but cannot bring her to make any changes. Cassandra falls in love with a man who has a secret which shatters her when it is revealed. Natalie gets involved in a turbulent relationship with a charismatic and mysterious Spanish writer. Adult love is as messy as young love. Mara di Sandro De Matteo is also a great cook and teacher. She shows a keen awareness of adult human emotions in her two novels. She shares her recipes and videos of her travels on her blog on MaraWriter.com. 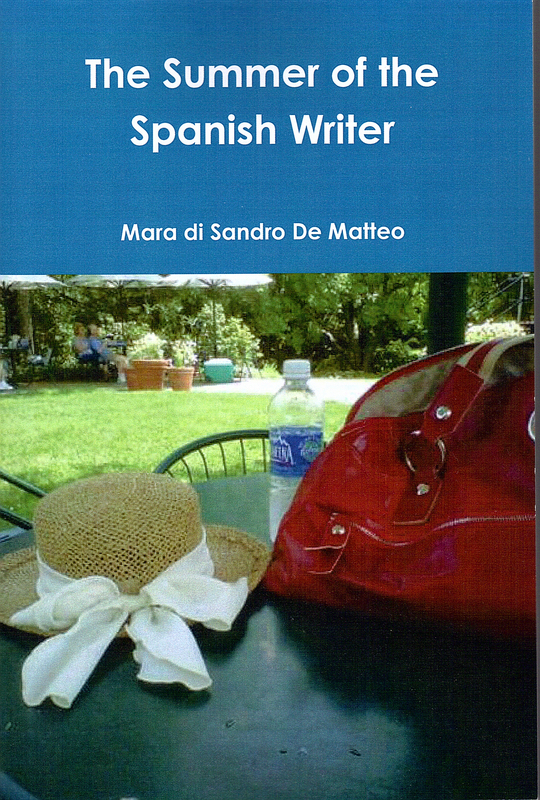 “The Summer of the Spanish Writer” is a novel I really appreciated a lot. Since the first lines it literally keeps you “glued” to the story and the characters. Cassandra and Natalie are the narrators, whose voices alternate and take the reader through their lives, their fights against reality, their desperate struggles to be loved. Every character lives in a façade that cannot continue forever and, incredibly, the turning point in their lives coincides with their casual meeting on their birthday, which is the same for both. From that moment on, a series of extraordinary events begin in their ordinary lives, which will evolve to new unexpected directions and that will require brave hearts and incredible inner strength. Mara di Sandro De Matteo created a realistic portrait of two women who, page after page, become familiar, friends whose lives and problems are in certain aspects so similar to ours. And, when the story ends, it leaves us with the curiosity to know what is going on now, in their new lives.